Bulges & Shadow Effects in Plaster Ceilings & Walls - the "Shadow Effect"
Here we provide a photo guide to identifying types of plaster installed in buildings, using building ceilings as a photo and investigation guide. In this article series we describe and discuss the identification and history of older interior building surface materials such plaster, plaster board, split wood lath, sawn lath, and expanded metal lath, Beaverboard, and Drywall - materials that were used to form the (usually) non-structural surface of building interior ceilings and walls. Page top photo provided courtesy of Minneapolis home inspector Roger Hankey. Shadowing bulged walls traced to gypsum lath installation: as our photos show, below, the wall in this New York home was bulged in a regular rectangular pattern. The building owners were concerned for possible exterior leaks into the wall cavity and a hidden mold problem. Because the home had experienced leaks in other areas and had other mold problems we investigated further. But the bulged wall problem in this case was essentially a cosmetic one identified and described as plaster wall shadow effect discussed below. If you shine a flashlight along, rather than directly at a wall surfaces, both regular details (such as regular, rectangular bulges in a plaster wall or ceiling) as well as irregular surfaces and defects are easily observed. In this photo you can see the convex vertical plaster wall bulges and the indentations at the plaster lath-board points of nailing to the wall studs. More about using oblique light to find building conditions is at FLASHLIGHT HELPS FIND MOLD. Minnesota inspection expert Roger Hankey has provided our next photograph, below, where the oblique light source was from a window at the right side of the picture. Shadow Effect A common problem with plaster applied over gypsum lath is the shadow or bulge effect. This was created when the plaster was applied too quickly. The finish coat was sometimes applied before the first coat dried completely. The moisture was driven back into the gypsum lath which sagged. The result is a pattern visible in the wall or ceiling that shows seams every sixteen inches in one direction. Sometimes seams are also visible perpendicular to these, at thirty-two or forty-eight inch intervals. 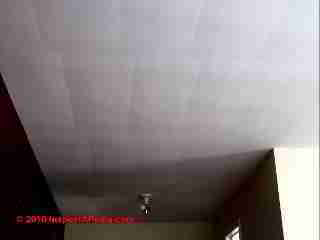 Compare bulged pillowed plaster ceiling with sagged 16 x 32-inch ceiling tiles? At ASBESTOS CEILING TILES - in the article FAQs section we discuss the possibility that the material shown at left, apparently 16" x 32" water-damaged ceiling tiles may contain asbestos and what to do about it. The ceiling shown above was found in home built in the 1940's. OPINION-DF: The SmartTrack explanation above leaves us a little unsure of the sagging plasterboard diagnosis even though we agree that visually, it's a "sag". Take another look at our bulged wall photograph above. And check the Carson Dunlop Associates explanation of the shadow effect on building walls (left). The identical bulging pattern appears on a vertical surface, with the convex side of the bulge facing into the room. While it's natural to suspect weight-driven sagging on a bulged plaster ceiling, gravity cannot not explain the roomwards bulge of the same pattern in a gypsum-lath wall. a. Cause: too much weight from overlaid insulation; exposure to sustained high humidity; vapor retarder improperly installed or wetting causes ceiling panels to sag after installation. Also caused by installing board too thin for framing spacing. Remedy: remove sagged board or fur ceiling using RC-1 Resilient Channels and apply another layer of board. But these causes do not address wall bulging, nor are the remedies complete as cause and cure of excessive interior moisture are not addressed. Further not all mistakes that might cause bulging or failures in board-lath plaster walls and ceilings are addressed, for example use of portland cement based plaster on gypsum board lath, or using perforated board lath on ceilings - two mistakes we discuss at PLASTER TYPE IDENTIFICATION. We offer an alternative explanation may explain the plaster pillow bulge, at least on walls: a too-wet, too thick, too-slow-drying second or finish coat of plaster applied over the gypsum board lath may have caused both softening (the sagging theory) and swelling-buckling away from the nailed edges (swelling-buckling theory). Wet, humid weather conditions at the time of installation may have been a factor. A useful ingredient in understanding observations of anomalies or defects buildings is the recognition of the presence or absence of uniformity. We must ask, why is this particular wall or ceiling bulged and not that one? Were they built at the same time, using the same materials? Really identical materials? What is different in and out of the anomalous area? If we can understand completely all of the forces at work, individual building defects will no longer include an element of chance. We also considered exposure to subsequent wetting events as a possible explanation for plaster sagging. The regular rectangular pattern surely has at its root the original panel size and the fact that panel edges were nailed to ceiling or wall joists or studs. Buckled gypsum board products, including modern drywall, are often observed to have deformed when wet along with their refusal to return to a flat position when dry. Indeed shadowing is described in gypsum product manufacturer's literature such as USG's "Plastering", and shadowing remains a cosmetic concern at joints in modern gypsum-board based plaster systems. To avoid modern shadowing at plaster board joints, two coats of veneer plaster are required at the tape joints and must be allowed to harden and dry before the plaster application is started. But we think that applying this description to the bulged plaster board lath panels above may be an error. An accurate understanding of the etiology of construction defects is important in forming a reliable opinion about their import as well as their cure or prevention. Many construction explanations mistake confidence for authority and expertise. We're researching this question and will post further results here - Ed. Cause: Temperature differentials in outside walls or top-floor ceilings causes collection of airborne dust on colder spots of interior surface, resulting in photographing or shadowing over fasteners, furring, or framing. Most severe with great indoor-outdoor temperature variation. Remedy: Wash painted surfaces, remove spots with wallpaper cleaner, or redecorate surfaces; change air filters regularly. Prevention: Use double-layer application with adhesively applied face layer. Use separately framed free-standing interior wall surface and insulate in void to reduce temperature difference between steel or wood components and panels. Watch out: although the ceiling in Mr. Hankey's photo (above) may be soundly secured, other cases of bulged plaster are unsafe. See PLASTER, LOOSE FALL HAZARDS for examples of bulged plaster that may be danger signs, including an example of a collapse of an expanded wire lath ceiling that had been improperly installed. Details about exterior stucco and metal lath are at STUCCO WALL METHODS & INSTALLATION. METAL LATH SPECIFICATIONS, SPECIFICATION FOR METAL LATH AND ACCESSORIES, LATH AND PLASTER [PDF[ Amico, a lath and plaster accessory producer. For plaster type surfaces used on building exteriors, see STUCCO WALL METHODS & INSTALLATION. Continue reading at PLASTER, LOOSE FALL HAZARDS or select a topic from closely-related articles below, or see our complete INDEX to RELATED ARTICLES below. 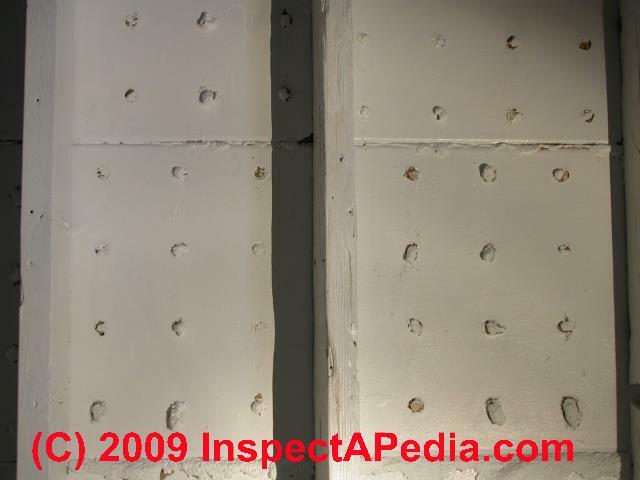 PLASTER BULGES & PILLOWS at InspectApedia.com - online encyclopedia of building & environmental inspection, testing, diagnosis, repair, & problem prevention advice. I am working on a house that seems to have intentional pillows in the plaster finish over plasterboard from the 1960's. The pillows are even straight lines (horizontal on the walls), and consistent in all rooms and the cathedral ceiling surface. Was there a finish 'feature' that this might be reflecting? The current contractor wants to get rid of them, but I wonder if we should keep them as an example of a long gone fashion. Thia, I would hae to see some photos. But my guess is sagging due to moisture - you can check what you see against the ceiling photos above. The pillow ceiling is on purpose. I would love to learn more about the style and how to repair them properly. MSDS: Gold Bond® brand gypsum board products, plaster base, National Gypsum Corporation. Other drywall MSDS sheets are found at Drywall MSDS.